This watch has a titanium bracelet and bezel, a silver tone, a black dial and white number markers. It is impressive looking yet subdued. It's also water resistant to 100 meters (330 feet). This watch also has two special functions - alarm and chronograph. The alarm is self-explanatory. 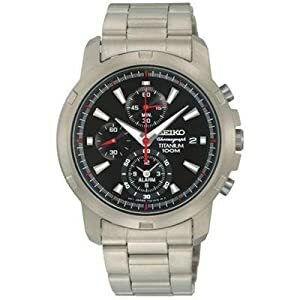 Chronograph means that the watch can also act as a stop watch. It has a fixed bezel (not rotating). The watch shows the date, but not the day of the week. It uses a quartz movement for accurate timekeeping. It has luminous hands and markers so you can see it in the dark. A nice watch at a reasonable price.